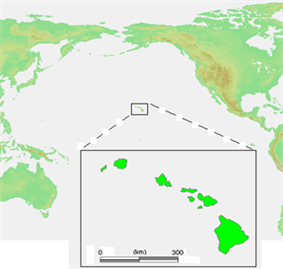 The Hawaiian kingdom was overthrown in 1893 as a result of the intervention of foreign business interests and the U.S. military. The Republic of Hawaii was led by men of European ancestry, like Sanford B. Dole and Lorrin A. Thurston, who were native-born subjects of the Hawaiian kingdom and speakers of the Hawaiian language, but had strong financial, political, and family ties to the United States. Dole was a former member of the Kingdom legislature from Koloa, Kauai, and Justice of the Kingdom's Supreme Court, and he appointed Thurston—who had served as Minister of Interior under King Kalākaua—to lead a lobbying effort in Washington, DC to secure Hawaii's annexation by the United States. 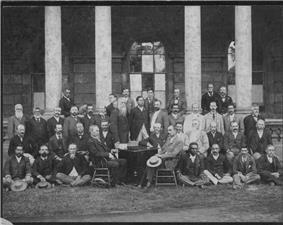 Following the overthrow in 1893, the Provisional Government lobbied the United States to annex Hawaii. They were successful with President Benjamin Harrison in negotiating an annexation treaty; however, Harrison's term in office came to an end before the treaty could be ratified by Congress. The new President, Grover Cleveland, opposed the idea of annexation, being an anti-imperialist himself, and withdrew the annexation treaty upon taking office. After commissioning the secret Blount Report, he stated that the U.S. had inappropriately used military force and called for the reinstatement of Queen Liliʻuokalani. The matter was referred by Cleveland to Congress after Sanford Dole refused Cleveland's demands, and the U.S. Senate held a further investigation, culminating in the Morgan Report, which completely rejected that there had been any U.S. involvement in the overthrow. The Provisional Government feared that President Cleveland might continue to support the queen by restoring the monarchy. The Provisional Government also realized there would be no annexation until Cleveland's term of office ended; and they wanted to establish a more permanent government until another president, more favorable toward annexation, came to office. Therefore the Provisional Government called to order a Constitutional Convention on May 30, 1894. The Constitutional Convention drafted a constitution for a Republic of Hawaii. The Republic of Hawaii was proclaimed on 4 July 1894 at Aliiolani Hale. The new state was a single-party oligarchy. The President of Hawaii was the republic's head of state and head of government. The constitution provided that the presidential term of office would be six years and specified that individuals could not be elected to consecutive terms in office. The president had the authority to veto legislation, which could be overridden by two-thirds majority in both houses of the legislature, and he was also commander-in-chief of the military. The president appointed, subject to the confirmation of the senate, members of his cabinet. Cabinet members were considered ex officio members of both houses of the legislature, they could participate in proceedings, but could not vote as they were not elected members of the legislature. If the presidency became vacant, the minister of foreign affairs could serve as acting president until the legislature voted to elect a successor. Article 23 of the 1894 Constitution specifically named Sanford B. Dole as the republic's first president. He would be the nation's only President, as it was annexed by the United States in 1900. Upon annexation, Hawaii became a U.S. territory and Sanford became its first governor. The republic's legislature consisted of a senate and house of representatives. Each had fifteen members with the former having six-year terms and the latter only two with the exception of the first legislature which was constitutionally granted a three-year term. Unlike previous governments or other common law jurisdictions where appropriation bills originate in the lower house, these bills originated from the minister of finance and were delivered to the senate. The senate also held the right to confirm presidential appointments and ratify treaties which made it more powerful in every aspect over the lower house. It was possible for legislators to concurrently serve as president, cabinet minister, or supreme court justice. As royalists had boycotted the republic and refused to take the oath of allegiance to run for office, the American Union Party won every seat in the 1894 and 1897 elections. There was also a property requirement, kept from the 1887 constitution, which ran counter to the prevailing trends of that period. The 1897 election had the lowest turnout in Hawaii's history with less than one percent of the population going to the polls. 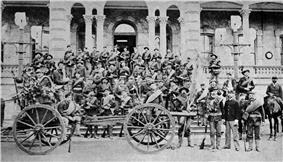 Troops of the Republic of Hawaii after the counter-revolution. Robert William Wilcox was a Hawaiian native revolutionary. In 1889, he led an army of 150 Hawaiians, Europeans and Chinese in rebellion against the Hawaiian Kingdom. Wilcox was brought to trial but released as juries refused to find him guilty of wrongdoing. In 1895, Wilcox participated in another attempt, this time to overthrow the Republic of Hawaii and to restore Queen Liliuokalani to power. Royalist supporters landed a cargo of arms and ammunition from San Francisco, California in a secret Honolulu location. At the location on January 6, 1895, a company of royalists met to draft plans to capture the government buildings by surprise. A premature encounter with a squad of police alarmed Honolulu and the plans were abandoned as the royalists were quickly routed. Wilcox spent several days in hiding in the mountains before being captured. The son of one annexationist was killed. Several other skirmishes occurred during the following week resulting in the capture of the leading conspirators and their followers. The government allegedly found arms and ammunition and some potentially evidential documents on the premises of Washington Place, Liliuokalani's private residence implicating her in the plot. 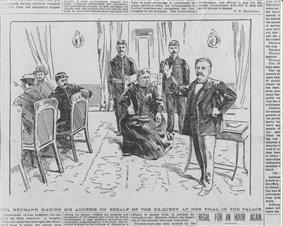 Newspaper illustration of Liliuokalani's public trial by a military tribunal in 1895 in the former throne room of the Iolani Palace. The Republic of Hawaii put the former queen on trial. The prosecution asserted that Liliuokalani had committed "misprision of treason," because she allegedly knew that guns and bombs for the Wilcox attempted counter-revolution had been hidden in the flower bed of her personal residence at Washington Place. Liliuokalani denied these accusations. She was sentenced to 5 years imprisonment at hard labor and a fine of $10,000. But the imprisonment was served in a small bedroom at Iolani Palace where she was guarded by military personnel at all times. After eight months she was kept under house arrest at her Washington Place home by President Sanford B. Dole. A year later she was granted a full pardon, including the right to travel; and President Dole gave her a passport to travel to Washington D.C. to visit her friends and in-laws. However, she used that opportunity to lobby the U.S. Senate in 1897 against annexation. Upon the inauguration of William McKinley as president of the United States on March 4, 1897, the Republic of Hawaii resumed negotiations for annexation, which continued into the summer of 1898. By this time, the President saw the islands as having gained a new strategic relevance in the wake of the Spanish-American War and that Britain, France and Japan had shown interest in annexing the islands for themselves. On June 16 of that year, a new treaty of annexation was signed. As the Senate appeared uncertain to ratify the treaty, its supporters took extreme measures by passing the Newlands Resolution through which the cession was accepted, ratified and confirmed by a vote of 42 to 21. The House of Representatives accepted the Newlands Resolution by a vote of 209 to 91. McKinley signed the bill on July 7, 1898. The formal claim of transfer of sovereignty took place on August 12, 1898 with the hoisting of the flag of the United States over Iolani Palace and renaming the island cluster the Territory of Hawaii. ^ Associated Press (16 August 2009). "Hawaii's Marks 50th Anniversary of Statehood: A brief history of Hawaii, from Polynesian voyagers to an island-born president". ABC News. Allen, Helena G. Sanford Ballard Dole: Hawaii's Only President, 1844-1926 (1998). Schweizer, Niklaus R. His Hawaiian Excellency: The Overthrow of the Hawaiian Monarchy and the Annexation of Hawaii (1994).